Melville Watts was the founder and driving force behind the Friends. He passed away on 19th August 2010 in his beloved Lydney Hospital. Click Here to read the article in The Forester newspaper. 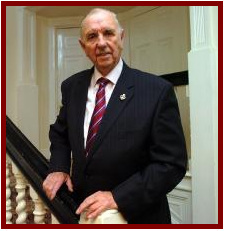 The tireless fundraiser, who was known affectionately as ‘Mr Lydney’, died on the morning of 19th August 2010. He was in Lydney hospital, which he helped raise more than £1 million to support, for several weeks. His death came less than a week after he celebrated his 87th birthday by cutting a cake. As news of his death spread, people lined up to say his death would be a huge loss to Lydney. “When I think of Melville Watts, I think of Lydney Hospital and the Friends. “He was a tireless champion of the Hospital, the Friends and indeed of the town of Lydney itself. “Our community was truly a better place for his presence and his loss will be keenly felt. “I was honoured to have known Melville over the last decade. “He had made a number of important documentary films reflecting life in the Forest of Dean. “He had used my services to digitise his unique and precious film archive. “We had many happy meetings here in Rhiwbina, the last of which was earlier this year when, with his cinema-enthusiast friend Keith Nunn, we enjoyed a Welsh Rarebit for lunch at the nearby Snails Cafe. “Melville, I shall miss your cheerful enthusiasm. ”There is no doubt that without his tireless efforts, we would have lost our precious hospital years ago to short sighted, city focussed health cuts. This man’s batteries ran at full power to the very end with Lydney Hospital and its wellbeing in his thoughts.